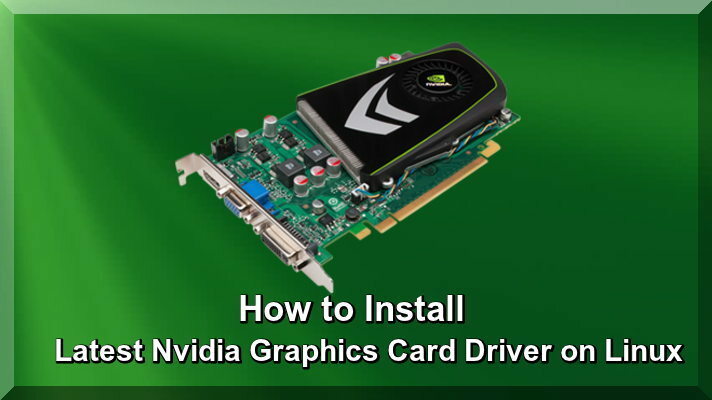 By this useful Article I guide you that how to install latest Nvidia Graphic Card Driver on Linux basis systems such as Linux Mint, Ubuntu latest Editions. You have purchased very latest Nvidia Graphics Card, now you are getting problem to install driver and the closed source non free Nvidia driver in the repositories of Ubuntu or Linux Mint. You have already read lot of tutorials but this is very different, one thing note that recent Nvidia Graphics Card Support is not available or you have any problem in this regard. When you are going to check on Driver Manager that Linux Mint and Additional Drivers of Ubuntu does not present on proprietary driver for the latest brand of Nvida Video Graphic Card. When you will check that as a safety with the default open source driver Nouveau running, and your current driver is not installed properly. You are game lover or Movies so you are not still satisfied from this default driver, because games and latest movies absolutely required the best available Graphic Card Driver. Often you have checked that rather risky system hack, and you get disturbance. By this article I will discuss on main two points that how to install latest Nvidia Graphic Card Driver on Linux Mint and Ubuntu latest versions. How to install Printers and Scanners on Linux Distros read this useful article. You should be visit first on Home page of Graphics Drivers PPA, and check that which versions of the Nvidia driver it include, recently I found the nvidia-370. Now the time is that you should be own search that what is the right version of the Nvidia driver for your Graphics Card. The target is to check whether your Graphic Card can run one of the driver versions that are available in the Graphics Drivers PPA Website. You can search following two types, but one thing note that you should not be download the driver from that website, because you are using PAA. Now you are going to install latest Nvidia Graphic Card Driver, first you should be move old default Nvidia Card Driver which already automatically installed on your Linux based system to use the following command in terminal. You have moved old default driver with successfully and now time it that install latest Nvidia Graphic Card driver though trustworthy PPA to use the following commands in terminal. Now you have used above command in terminal your latest Nvidia Graphic Card Driver installed properly, and now Reboot your system, and your Graphic Card should run on the latest driver. If you want to check that your latest card is working properly use the following command in terminal. In any case the above operation has failed, so your video card probably still runs on the open source driver Nouveau, you can check it with following command in terminal. If you want to remove Graphic Card Driver and you do not like your new installed Nvidia driver, it is very simple to remove it, you can remove it from software source, if not or any problem use the following command in terminal. Press Enter and type your password all your Nvidia Graphic Card Driver will be removed easily, after that Reboot your system. When you will see that your Graphic Card Driver now run again on the open source driver Nouveau, which you can check it to use the following command in terminal. In view of the above, this is very profitable article which you have already read lot of tutorials this very knowledgeable that how to install latest Nvidia Graphics Card Drivers on Linux Based Systems.